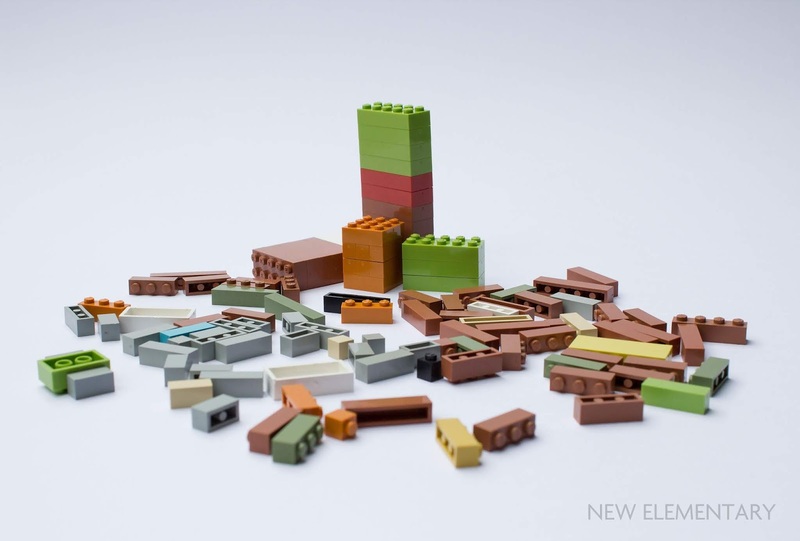 I already knew that Modulex had totally different measurements to the LEGO System so I've never expected that some kind of 'real' integration would be possible. My aim was to find some technique that would lock the Modulex without using the studs; e.g. with bars and clips or even with Technic elements. So I just decided to order a selection of cheap parts; a lot of Terracotta Modulex tiles in a variety of different sizes. 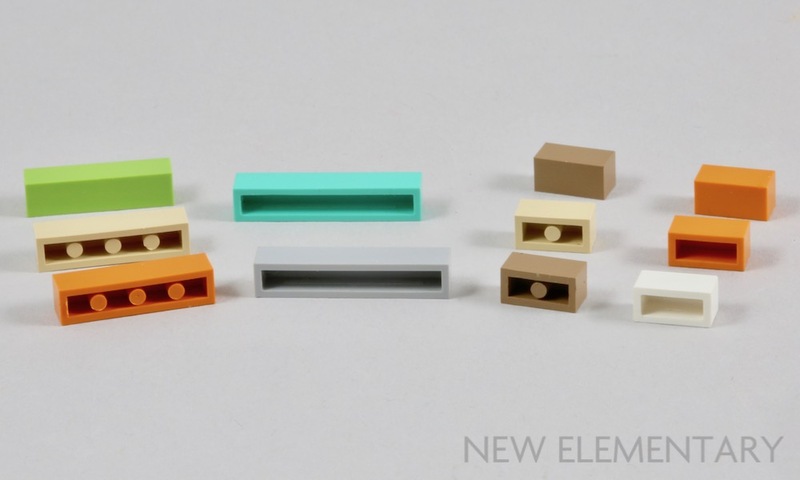 I always tinker around when holding LEGO in my hands and I always have some Tile 1x2 (Design ID 3069) around. It's one of the parts that my building style depends on, as they have no tube underneath and so are movable. This is a great tool for fixing holes when building out of System. It didn't take too long till I stuck a Tile 1x2 on to a Modulex 1x3 brick. 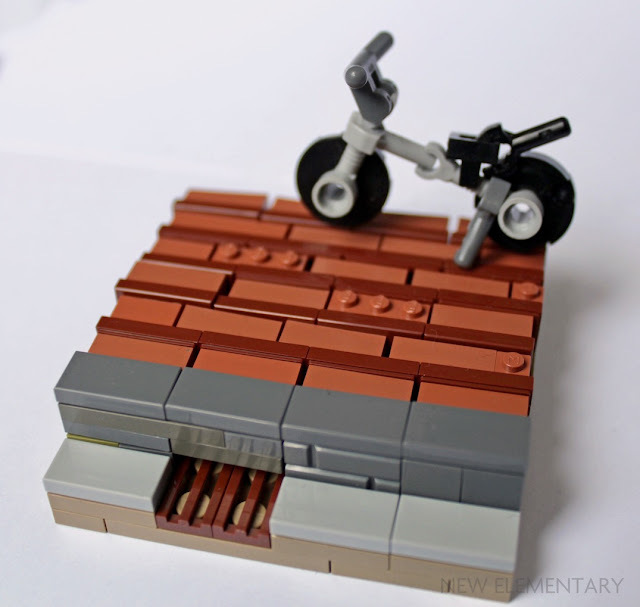 I was quite surprised that the brick connected well with perfect clutch, it almost seemed like it was made for this. No forced too-tight connection. Just a smooth fit. Further investigation showed that a 1x2 plate did not fit, as the middle stud of the Modulex collided with the tube on the underside of the LEGO plate. Same with a Brick 1x2 (Design ID 3004) but not with a Brick 1x2 without pin (Design ID 3065). 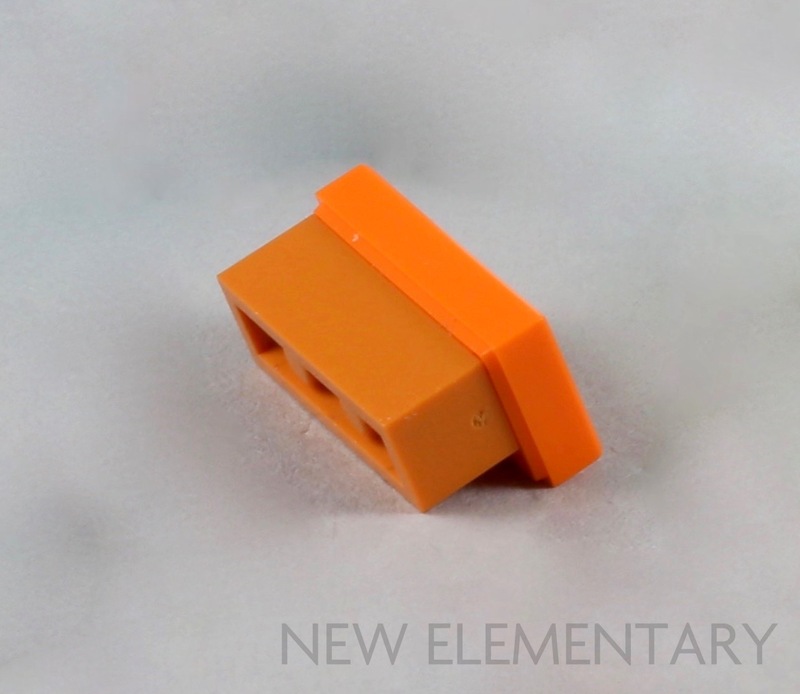 It seems we can integrate every LEGO 1x2 System element that does not have a pin. This includes: Brick 1X2 without pin (Design ID 3065), Palisade Brick 1x2 (Design ID 30136), Ingot (Design ID 99563) and the most recent 'Jumper' Plate 1X2 W. 1 Knob (Design ID 15573) – the earlier variations (Design ID 3794) will not work. 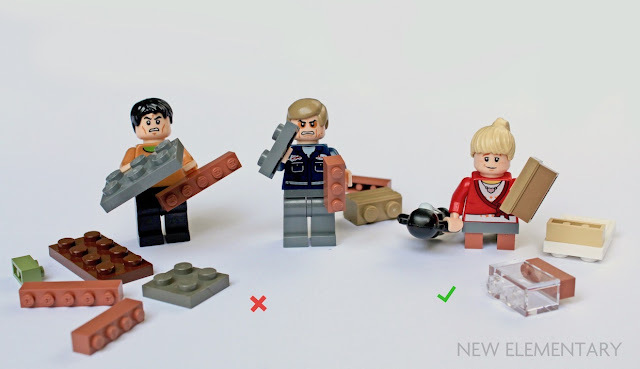 Unfortunately, the '3 Modulex studs to 2 LEGO studs' ratio seemed to be the only one that worked and even then, multiples of the 3:2 ratio do not work, e.g. a 1x6 Modulex brick is much smaller than a Brick 1x4 (Design ID 3010). To be honest, being able to successfully connect a tile to Modulex parts was more success than I expected. This connection alone allows a variety of applications. As the colour Mx-Brown is a little darker than Dark Tan, they go together quite nicely. 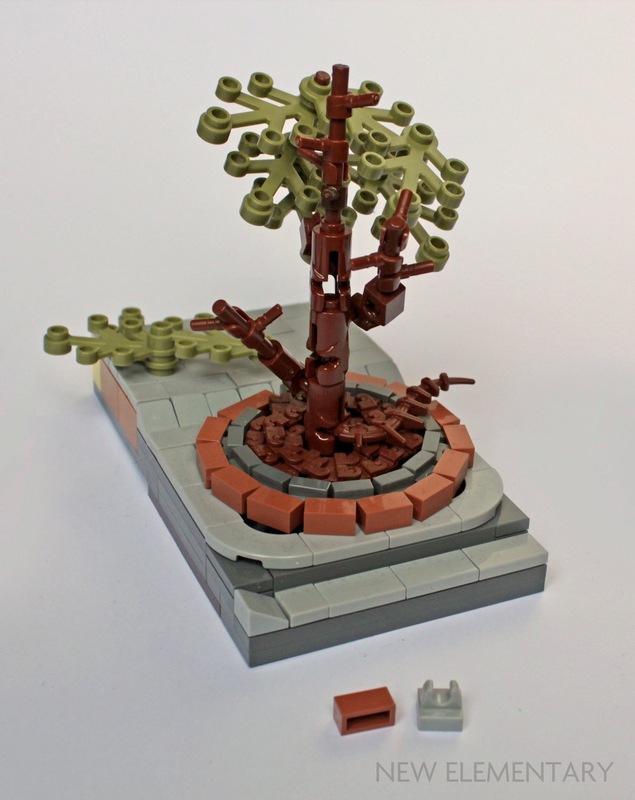 The combination immediately reminded me of cardboard, which led me to my first little scene. It is important to note that the Modulex brick fits in length but not in width. This is actually useful as the offset portion of the tile remains free for connection to a LEGO plate between the raised studs or to attach a variety of clips to hold the integrated section in position. The post box to the left of the front door in the image below is an example of this technique. An Ingot (Design ID 99563) was used instead of a 1x2 tile, and a Plate 1X1 W. Holder (Design ID 4085) connects to hold the Ingot in place. The house number is a printed 1x1 Modulex Tile, and this connection will be discussed later. 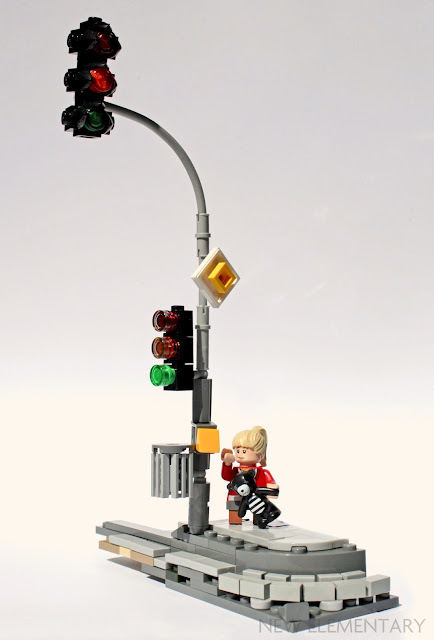 The next technique starts legally with LEGO tiles held between the studs on a plate. The gap between each row of tiles can then be utilised for holding Modulex. 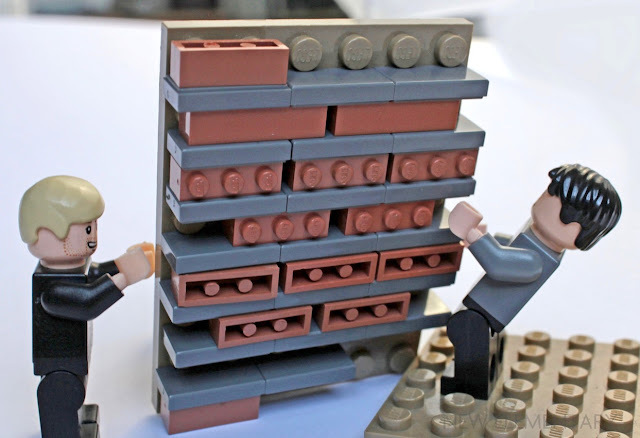 Some Modulex bricks are connected to the tile, while others are simply held between the tiles with friction. This allows variations in texture and surprisingly they hold very well. 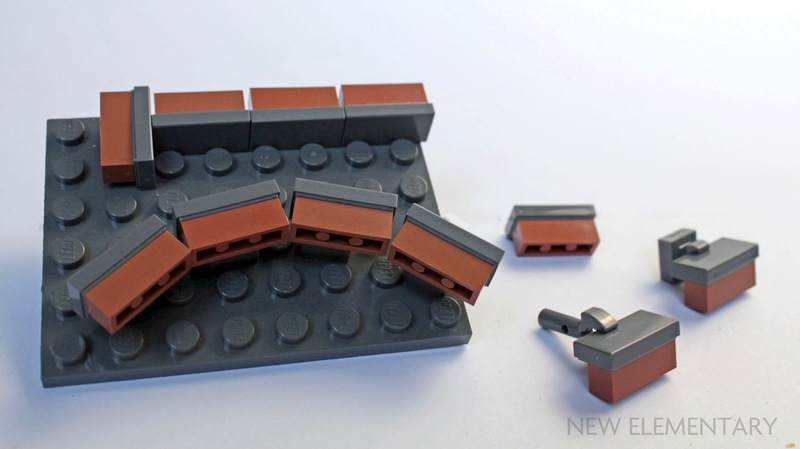 As you can see, the rows of Terracotta Modulex bricks and tiles are held in place by the Reddish Brown LEGO tiles to give an uneven paved affect. Now we come to the technique that is probably the most versatile and useful! The Plate 1X1 W. Upright Holder (Design ID 2555) can be used to firmly hold Modulex Tiles in place. I used this attachment within the house number in the mailbox example. Discovering this technique was a major breakthrough for me although I later found out that others already knew and had documented this connection. It is important to note that not all Plate 1X1 W. Upright Holder are the same. Only those in bold below will fit. The most important differences are within those with Design ID 2555. Type a is rounded while b and c both have straighter sides. There is a subtle difference between b and c, but it's important. Type b will not fit as the square clip ends are thicker than c. Thankfully type a is very common despite the mould retiring in 2015. Type e is the current mould used, with improved engineering to avoid stress. The clip arms in the other moulds are liable to cracking and snapping off. Connecting Modulex 1x1 tiles to a plate is quite useful since Modulex offers a large variety of 1x1 letters and digits. If we continue with this particular connection and compare two similar walls, below; the wall on the left is mainly constructed with Modulex 1x3 tiles while the right version uses system Tile 1x2. In the picture the Modulex version looks quite nice, but the horizontal gap between each row is quite large so it is worth considering which look is better for your build. You can also link elements and bend them a little. The Plate 1X1 W. Upright Holder offers enough grip to set at angles. So, what do we get when connecting some tiles and angling them? Bendable arcs! This was like a dream come true for me. Below is another example of using the Modulex Tiles held in place by Plate 1X1 W. Upright Holder to form the curved corned of the pavement. Join us next time when Ralf will be taking a look at further techniques and then showcasing some of his creations that put all the examples to use in larger LEGO creations. 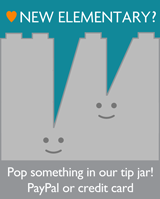 You can help New Elementary by buying from Amazon. Or send an amount of your choosing via PayPal or card, by clicking the image on the right. Think of it as the price of an app, or a book, or a yearly magazine subscription – whatever we're worth to you, we'd be honoured to receive it. Yes, we've linked to those in the past but always worth another view! Elspeth an I were aware of the techniques mentioned by Ryan Howerter and there are also many, many others (e.g. Brixe added quite a lot). I would say it's a different approach here; mostly different techniques and a different aim. 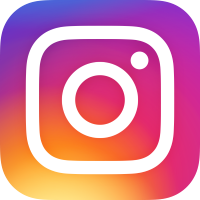 I would like to offer a suggestion for a future post (perhaps this could be a challenge). Can you review Clikits parts and their integration with system? Clikits parts actually seem easier to connect with regular System parts. 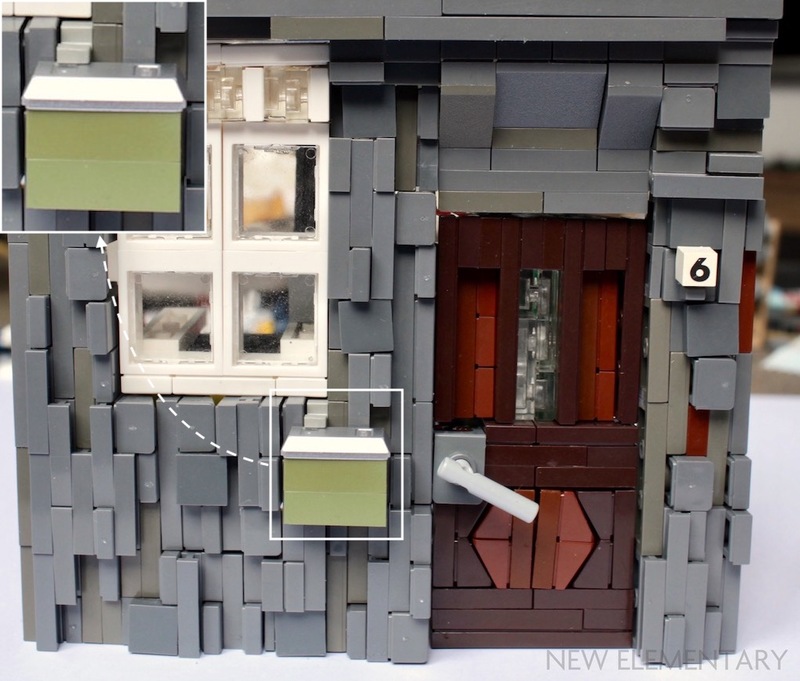 Clikits icons with pins fit into Technic holes, into tubes and inbetween tubes at the bottom of bricks and plates, and placed offset on hollow Technic studs. Clikits icons with holes fit on regular Lego studs. I have a couple, both of Clikits and Modulex parts, that I found cheaply on thrift stores and similar, so I should probably use them for something, someday. I'm not sure if it's a typo, but I think the technique of placing tiles or plates between studs actually is illegal, since it puts extra stress on the parts, IIRC. Plates are illegal, tiles are legal. They are microscopically thinner. I have a bit of a question on part 2555 thatI was hoping you guys may be able to help me with. I ordered a bunch from a BL seller in black, and some have a matte finish. They are still identified with 2555 underneath, but there is no (c)Lego stamped there. I'm pretty sure they are type 'c' in the picture above. 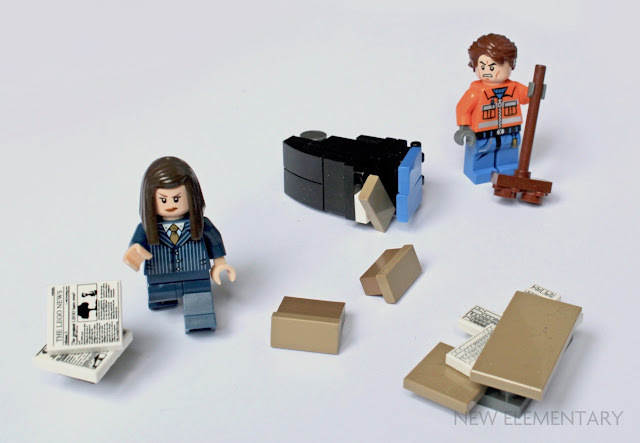 The matte finish and absence of Lego branding made me think that they were non-Lego, but I remembered how many times the mould had changed and recalled seeing this article, so I thought I'd check in with some experts before I ask the question of the seller.